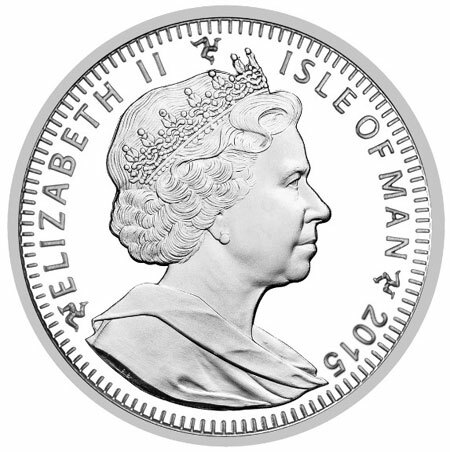 The Treasury & Government of the Isle of Man have announced the issue of a new crown coin which will mark a very special milestone for the Island’s head of state, that is of course Queen Elizabeth II who is formally referred to as the Lord of Man. Not only for the Isle of Man but for the United Kingdom and the commonwealth, Queen Elizabeth will, on the 9th September, reign the longest of all English and British monarchs – surpassing the record created by her Great-Great Grandmother Queen Victoria who herself, reigned for a total of 63 years and 216 days. On the 24th September 1896, Queen Victoria actually surpassed the reign of her Grandfather King George III who himself reigned for a total of 59 years, 96 days from 1760 to 1820. The Queen’s reign began on the 6th February 1952 when the new 25 year old princess and heir-presumptive succeeded her father, the ailing King George VI as monarch of the United Kingdom and the British Empire. The king had been ill for some time and it was known within his immediate family that he was terminal. Princess Elizabeth had agreed to tour the African colonies with her husband the Duke of Edinburgh, and it was in Kenya that she had learned of her father’s death. The new Queen had returned immediately to London and it was at the airport that Princess Elizabeth, now Queen Elizabeth II where she received her new ministers, on the tarmac of the runway who bowed to and saluted their new monarch. The Queen’s reign, close to 64 years has witnessed many changes to both the United Kingdom but also to the Empire, referred to as the Commonwealth of Nations, many countries of which still recognize the Queen as their head of State including Australia, Canada and New Zealand. She has in-arguably become the most famous woman in the world for all these years with her image included on more coins and banknotes than any other person in history – attested to by the Guinness Book of World Records. Queen Elizabeth also holds the record as the country’s oldest monarch, at 89 years of age, the UK and commonwealth are preparing to celebrate her 90th birthday in April 2016. The Queen is the longest married monarch who has shared her life with Prince Philip, the Duke of Edinburgh for almost 68 years. The coins, three in total including a five-ounce option are produced by the Pobjoy Mint UK on behalf of the Treasury and Government of the Isle of Man. They depict Her Majesty on Horseback which is taken from the Queen’s original Great Seal of the Realm. The Great Seal is an implement that is used to symbolize the Sovereign’s approval of important state documents. Sealing wax is melted in a metal mold and impressed into a wax disc that is attached by cord or ribbon to documents that the Monarch wishes to make official. Each time a new Monarch accedes to the throne, a new Great Seal is produced and is only replaced for a particular Monarch if the silver plate wears out. 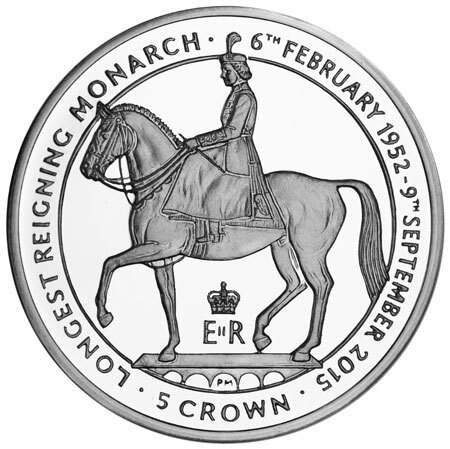 The obverse of the coin features an effigy of Her Majesty Queen Elizabeth II, Lord of Mann, by Ian Rank-Broadley FRBS. Available in Cupro Nickel (BU), Proof Sterling Silver and 5oz Fine Silver, the coins are struck to the highest quality with the precious metal versions being produced with a pristine ‘proof’ finish. The design on each coin is in relief with a glorious mirror-finish background. For more information on these and other coins issued by the Treasury & Government of the Isle of Man, please visit the website of the Pobjoy Mint at: http://www.pobjoy.com/products/view/isle-of-man-2015-hm-queen-elizabeth-ii-longest-reigning-british-monarch-ste Information offered in English, international orders dispatched where applicable. I couldn’t follow your post in past 5-6 weeks due to my busy schedule. Would look forward to your interesting articles. Yes, there have been additional issues from these Mints & Banks – the problem is, due to my own busy schedule, I usually rely on the press releases their marketing departments send out and… if they don’t send them out – its up to our readers to alert us here and we’ll try to research these and hopefully post something interesting on what’s out there. I will contact some of the marketing departments myself and hopefully fill the bulletin with more information, one to come shortly is the latest issue from Hungary on the 30th. Yes, due to their on going crisis bank of Greece didn’t send out any mail ( which they used to do diligently earlier) however what surprised me was that they still went ahead with the release on 22nd June , with the country in deep financial mess and creditors knocking harder then ever. & much like earlier their low m mintage release of 1500 coins was sold out in couple of hours. I would look forward to your stories. Well, while the situation of Greece is very unfortunate and my heart goes for people who are facing hardships however if greece doesn’t agree to creditors demand and decides to exit EURO, the Aristophanes coin could might as well become their last Euro coin ! Do you think this status might make people step over each other to acquire this coin ?? Well, as I have heard, the distinction as the last Greek Euro coin might indeed be the coin issued on the 22nd but, it isn’t too much of a concern in Greece at the moment, but more with collectors as Greeks are concentrating on what will replace the Euro and when. Yes, it will have more of a significance as being the last Greek euro commemorative coin but then all of them will be special for this reason – and as the only country so far to have exited the single currency, an interesting series but… we’re “jumping the gun” so to speak and although I personally believe that Greece would be economically better off out of the Euro, I know many Greeks wish to remain as it has been Greece’s prior experience that the national currency of years past has lost its overall value due to runaway inflation & having its exchange rate reduced against other currencies by the Central Bank. We are in un-chartered territory for the time being but I cannot see any scenario – in or out of the Euro, accepting or rejecting the ECB & IMF offer as the amount of the bail-out and Greece’s lack of moderisation and competitiveness with its economy can ever pay back such a vast amount and… the present government with its outlook of further nationalisation of industry as it espouses is simply not the answer. Greece needs a government who are prepared to implement massive restructuring of its economy, enact more competitiveness, concentrate on a more comprehensive tax collecting system and relax the labour laws enabling people to go where they are needed and re-train when necessary – this overhaul was experienced by many European economies many years ago and Greece is simply lagging behind to many countries who modernised long ago. I haven’t even touched on the sad fact that the Euro itself hasn’t helped the situation much with its unhelpful rate of exchange, a currency which is way over-valued for many of its member states to trade its goods & services internationally. This circumstance has only recently been addressed by the ECB when they implemented QA which affected the value of the euro and lessening its rate which has been helpful to some countries but some have said “too little – too late”, let’s hope not. If there are any announcements as to their status in the single currency, we will post something but in the meantime, there are still 19 member states in the Euro-zone and if it benefits Greece to remain, then I hope this can be salvaged.